Day 3 of the trip dawned fine and sunny, unlike the day before. The previous two days had given us great walking, but hadn’t exactly been true to the title “A short walk in the Carneddau” – In fact, Day 1 had been quite long and the weather on Day 2 had dictated a change of plan, and although the walk had been short, it hadn’t been in the Carneddau at all! 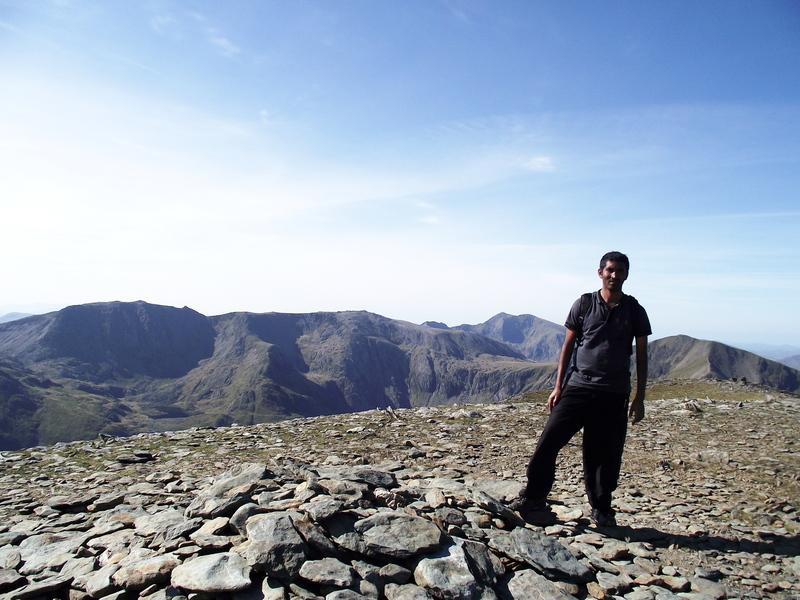 However, the last day had to be reasonably short, as Shreyas and Ravi had a train to catch, but I had the perfect route in mind – Carnedd Dafydd from Ogwen. We started from the long lay-by on the A5 near Gwern Gof Uchaf farm and campsite. The path up to the small lake of Ffynnon Lloer gave great views of Tryfan and Y Garn, and brought us to the start of East Ridge of Pen yr Ole Wen. The path gains height steadily, and is a far more pleasant proposition than the South Ridge rising directly above Ogwen Cottage. There is even a pleasant ‘hands-on’ scramble up a short groove, spoiled only by the fact that it isn’t long enough. Shreyas making short work of the scramble! 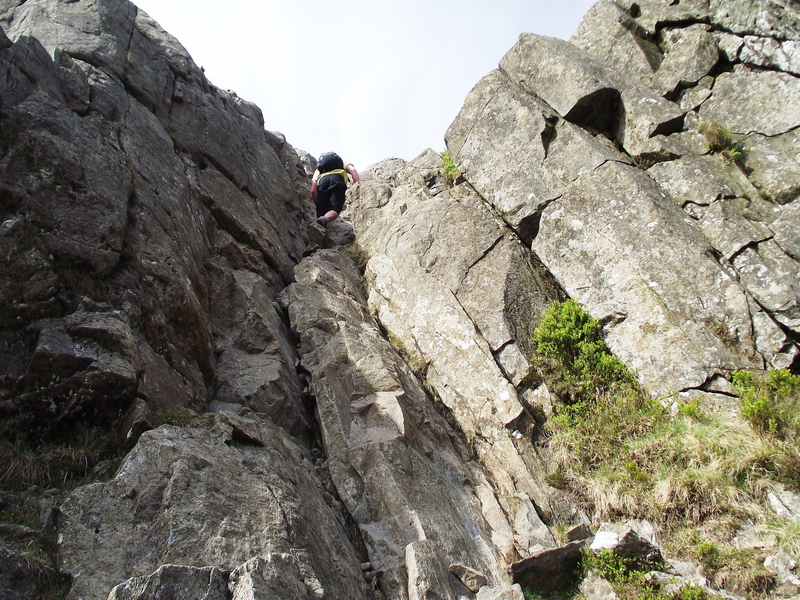 Beyond there the path weaves about a bit, still gaining height with several frustrating false summits. Then, suddenly, it all goes flat (in the best possible way) and in good weather conditions the scenery is amazing. Pen yr Ole Wen is in one of the best positions to get all round views of Snowdonia, and some time was spent admiring the panorama. In fact, the only hills that you can’t see all that well from here are the remaining hills of the Carneddau, mainly because Carnedd Dafydd (David’s Cairn) is blocking the view. 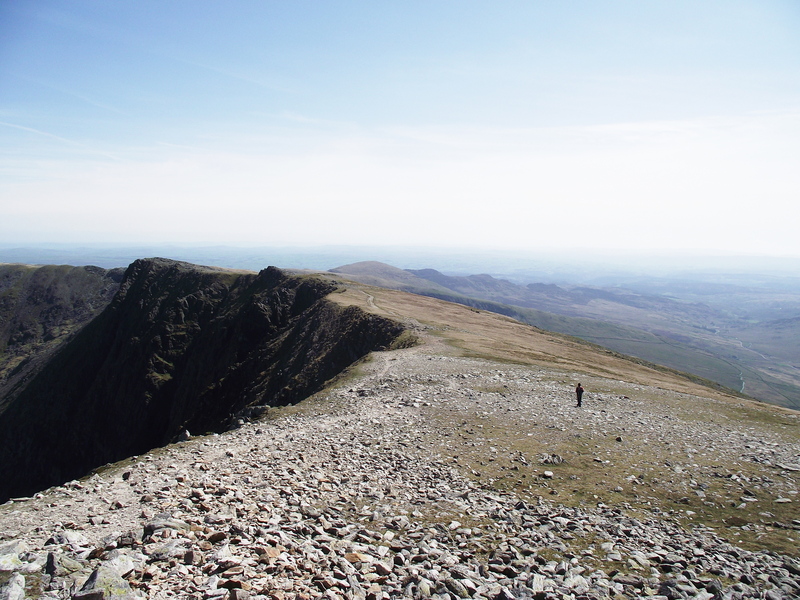 So, the solution is to continue to Carnedd Dafydd. 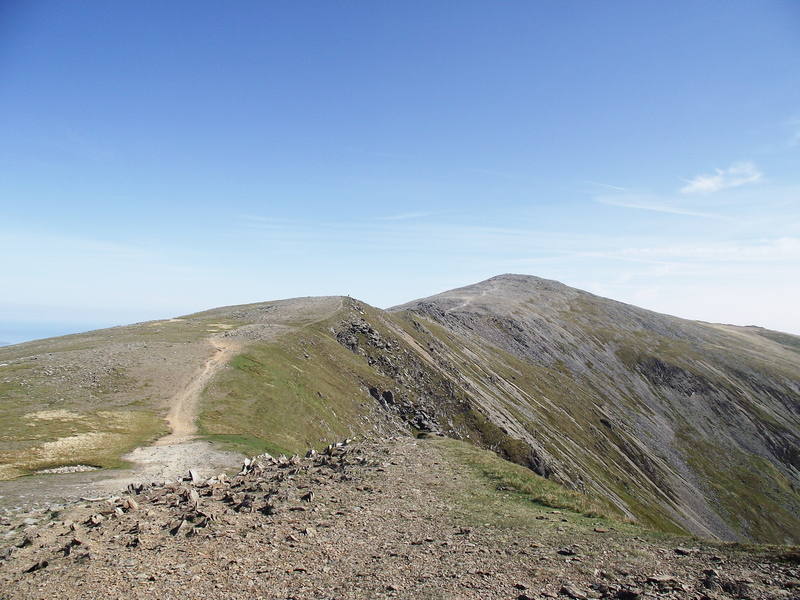 The route follows a broad ridge, passing Carnedd Fach (The Small Cairn) before finishing on Carnedd Dafydd itself, our highest summit of the day at 1044 metres altitude. The group of hills is named The Carneddau (The Cairns) after the many cairns found hereabouts, some of them very ancient indeed. 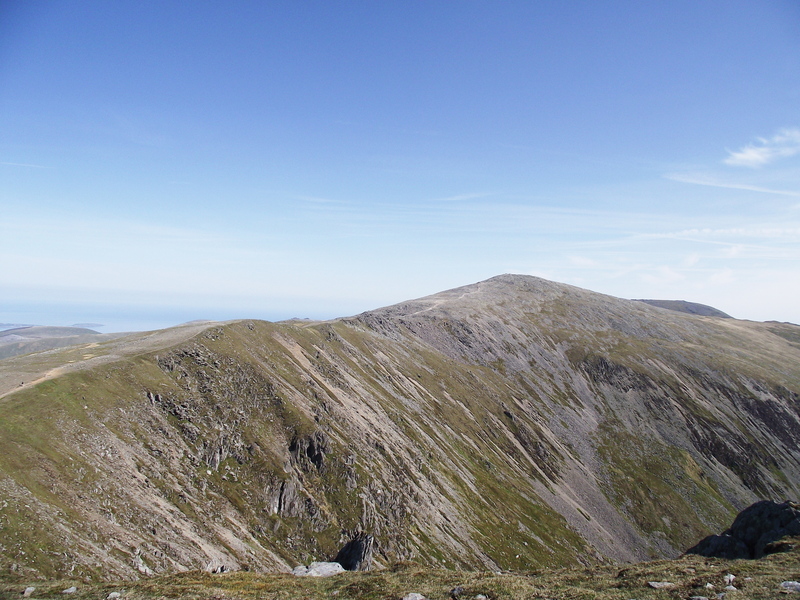 Carnedd Dafydd and Carnedd Llewelyn (Llywelyn’s Cairn) are popularly believed to be named after Llywelyn ap Gruffudd and his brother Dafydd ap Gruffudd. The story of Llywelyn and Dafydd, the last true Princes of Wales, is not a happy one. In the 13th Century the English, under Edward 1st, were in the process of bringing Wales under English control; Llywellyn and Dafydd were both captured and killed, and to complete their control of Wales, the English took Llywelyn’s daughter, Gwenllian, and imprisoned her for life, as they also did with Dafydd’s sons, Llywelyn and Owain. Edward subsequently gave the title “Prince of Wales” to his own son, and the title has gone to English princes ever since. 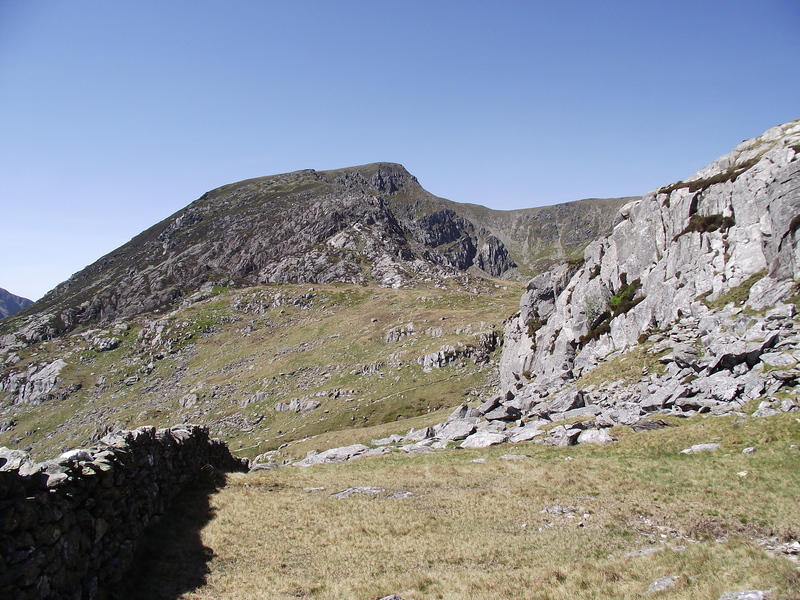 Gwenllian, the last heir of a Welsh dynasty, has recently been commemorated by the Ordnance Survey, who have renamed Garnedd Uchaf (The High Cairn) as Carnedd Gwenllian. 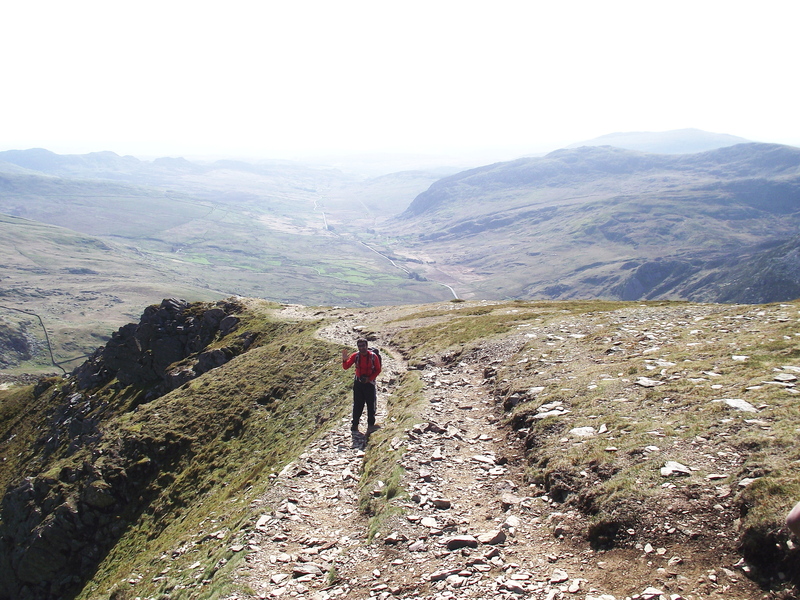 From Carnedd Dafydd we followed a typically “Carneddau” style plateau, heading towards the top of the cliffs of Ysgolion Duon (The Black Ladders) where the intention had been to find a path straight down to Fynnon Lloer. 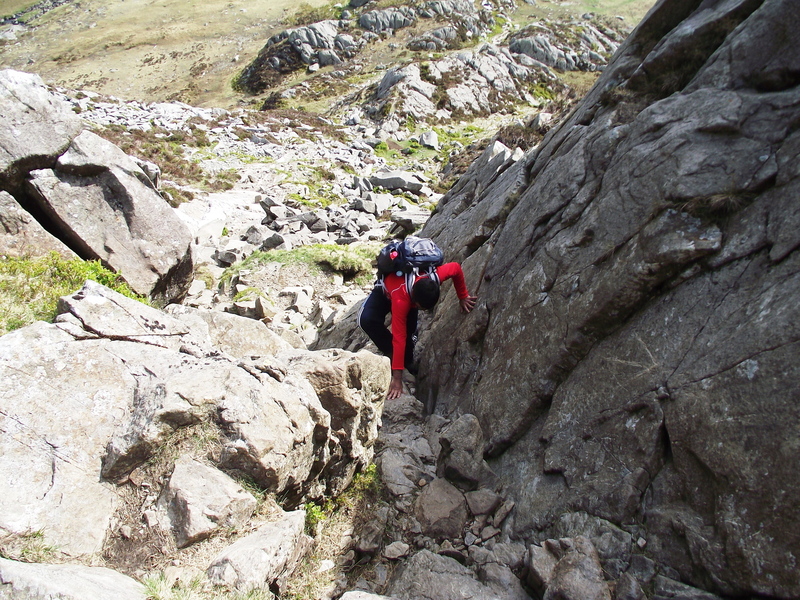 Having failed to locate the top of the path, we resorted to the original plan and followed an easy grassy descent back to the stream of Afon Lloer, and the path we had used earlier in ascent. 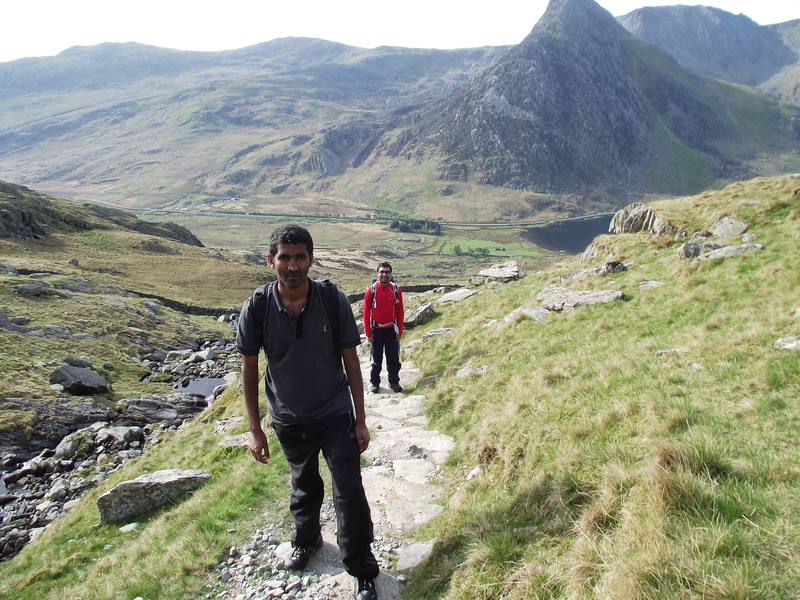 A quick descent to the road followed, with Shreyas and Ravi eventually heading to Bangor for their train connection, hopefully with many happy memories. For me it was home for a quick turnround, then straight off the next day to Mid-Wales, and a walk in the Brecon Beacons a couple of days later. p.s. For those who are enjoying the blog, you can get an email alert of a new post by clicking the “Sign me up” button on the right margin. Or why not share the blog with your mates on Facebook? p.p.s Off to Skye and the Hebrides today, so the next two posts might not appear at the usual time or day (early Monday morning), all depending on finding internet access. This entry was posted in 5. 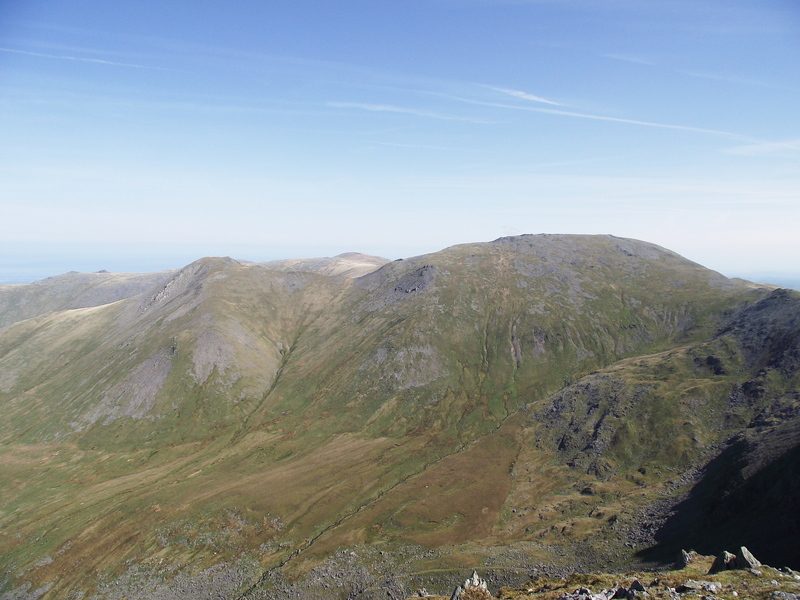 North Wales and tagged Carnedd Dafydd, Carneddau, hillwalking, mountains, Pen yr Ole Wen, Snowdonia. Bookmark the permalink. That route you went up from FFynon Lloer to get to Pen yr Olau Wen is the way I came down with my friend and his sheepdog. It was quite a hefty beast and he had to keep passing it down sections of that gully to me – didn’t help his dog didn’t really like me either! I’ve got a harness for our dog now – a proper, pukka, ‘haul yer dog up a cliff face’ harness. Trouble is, ‘Mist’ is so agile that it’s usually not worth the bother getting it out – mind you, she’s very trim but still weighs 19kg, so she’d be a bit of a lump to haul straight up!